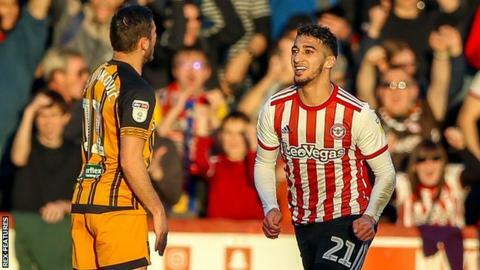 Said Benrahma starred with his first Brentford hat-trick as they came from behind against Hull to secure their sixth straight home victory in style. The Algerian winger set up Kamohelo Mokotjo to cancel out Fraizer Campbell's opener for the visitors before grabbing a quickfire double to put the Bees on top before half-time. Top scorer Neal Maupay made it 4-1 with his 22nd goal of the season early in the second half and the classy Benrahma completed his treble 10 minutes from time. The resounding victory equalled Brentford's best of the season - against Rotherham on the opening day - and they remain 16th in the Championship table, while Hull slip into the bottom half. The visitors made the better start at Griffin Park and Kamil Grosicki raced clear on the left before delivering a far-post cross for Campbell to score with a bullet header in the 24th minute. But Brentford turned the game around with an emphatic three-goal burst after the referee played the advantage after a foul on Benrahma, who played in Mokotjo to sidefoot the equaliser. Five minutes later, Benrahma collected a pass from Moses Odubajo and deftly weaved his way past three Hull challenges before unleashing a curling finish into the top corner. Sergi Canos won possession to set up the Bees' third goal, finding Maupay who laid the ball off for Benrahma to steer in from close range. Evandro raised hopes of a Hull comeback with a volley that Dan Bentley tipped over, but Maupay immediately made it 4-1 after Ollie Watkins' initial effort had been saved by substitute goalkeeper George Long. And ther Tigers keeper was left helpless as Benrahma rounded off a stunning performance late on, latching onto Romaine Sawyers' pass and finding the corner of the net. "When he (Benrahma) plays like that, he is a joy to watch. He's exciting every time he gets the ball because he can create something out of nothing. It is like magic and very few teams in this league have that. "His finishing has got better and better but his assists are also incredible. His run and pass for Kamohelo Mokotjo made that the most beautiful goal of the day for me. "He is growing more and more composed and when he runs at defences he is terrifying because he can go left or right. When players mark him he'll pass the ball for another of our front three to do some damage. "The key thing is that we defended well in the first 25 minutes and stayed in the game. No matter what happens, we have to stay in the game and we did that well today." "We knew what a good footballing side Brentford are and their front three are always going to be a problem. So we changed it and tried to be bold in terms of getting at them and I thought for 25 minutes we were excellent. "But then you see the situations. The first goal they scored, one of the players just lets the man walk past him and he gets an open goal to put the ball into the back of the net. That gives them impetus, then three tackles don't go in (for the second goal). "We allowed them far too much space and we're 3-1 down at half-time, then we gift them another goal and that made it really challenging for the final half-hour because you could see from the body language everyone was really demoralised. "Let's not hide away from it - we started the game really well, finished the game really poorly and we've come away from home with a bad result." Match ends, Brentford 5, Hull City 1. Second Half ends, Brentford 5, Hull City 1. Evandro (Hull City) is shown the yellow card for a bad foul. Attempt missed. Kamil Grosicki (Hull City) right footed shot from the left side of the box is too high. Assisted by Jarrod Bowen. Yoann Barbet (Brentford) wins a free kick in the attacking half. Corner, Brentford. Conceded by Liam Ridgewell. Attempt blocked. Josh Da Silva (Brentford) left footed shot from outside the box is blocked. Assisted by Josh McEachran. Substitution, Brentford. Jan Zamburek replaces Said Benrahma. Josh Da Silva (Brentford) wins a free kick on the right wing. Foul by Robbie McKenzie (Hull City). Goal! Brentford 5, Hull City 1. Said Benrahma (Brentford) right footed shot from outside the box to the top right corner. Assisted by Romaine Sawyers. Attempt missed. Said Benrahma (Brentford) right footed shot from outside the box is close, but misses to the right. Assisted by Josh McEachran. Attempt saved. Kamil Grosicki (Hull City) right footed shot from more than 35 yards is saved in the bottom left corner. Substitution, Hull City. Manuel Milinkovic replaces Fraizer Campbell because of an injury. Substitution, Brentford. Josh Da Silva replaces Neal Maupay. Attempt blocked. Sergi Canos (Brentford) left footed shot from the right side of the box is blocked. Assisted by Yoann Barbet. Attempt blocked. Neal Maupay (Brentford) left footed shot from the centre of the box is blocked. Attempt saved. Neal Maupay (Brentford) right footed shot from the centre of the box is saved in the centre of the goal. Assisted by Sergi Canos with a cross. Attempt missed. Yoann Barbet (Brentford) header from the centre of the box is close, but misses to the right following a set piece situation. Attempt missed. Kamil Grosicki (Hull City) right footed shot from the centre of the box is close, but misses to the left. Assisted by Evandro.